A pterygium is a triangular shaped, slightly elevated and often red, lesion which may occur on the surface of the eye, usually on the nasal side of the cornea. 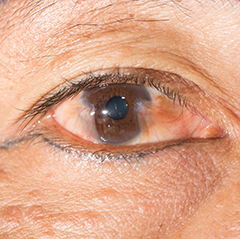 The lesion is a benign connective tissue overgrowth involving the conjunctiva and is related to ultraviolet light exposure. Most patients consult with their ophthalmologist for one of three things: the appearance of the lesion, the lesion is irritating the eye, or it is affecting vision. Surgery is the only way to remove a pterygium. Surgery for excision of pterygia usually is performed in an outpatient setting under local or topical anesthesia with the patient returning home the same day. The pterygium is carefully dissected away, and Dr Burk uses a conjunctival graft to decrease recurrence. Postoperatively, the eye generally is patched overnight and healing typically takes a couple of weeks with the use of prescribed topical eye-drops or ointments several times a day. In the early phase of healing, the eye may be slightly swollen and bloodshot in appearance. Eventually the surgical site improves in comfort and appearance. Your eyesight is too precious to compromise!